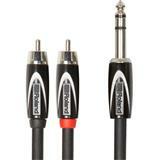 The FL23150 is a double cable from 2x RCA male to 2x mono jack plugs. Length: 1.5 meter. 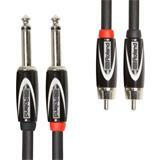 The FL233 is a double cable from 2x RCA male to 2x mono jack plugs. 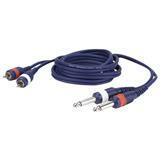 Length: 3 meter. 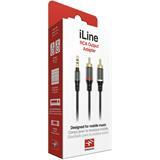 Interlink cable realized with moulded stereo jack 3,5 mm, two RCA moulded connectors and shielded cable. Available in black/orange. 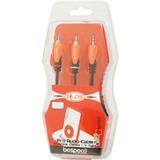 Length 3 meter. Packaged on blister.